About 19" (48.5 cm) brim circumference. Portland, Oregon is known as the Rose City. It’s also known for a lot of gray days! 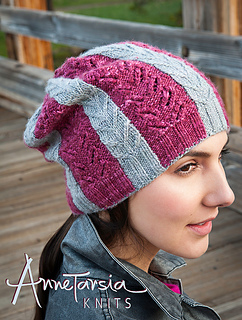 The deep rose color and steel gray of the Malabrigo yarn used in this hat are a very good representation of our city. 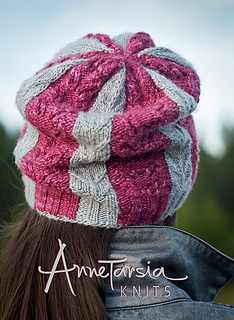 Combining lace and small cables “in the round,” this pattern is for the intermediate Annetarsia knitter who is confident with the ITR technique and is ready to incorporate other stitch patterns into a project. The lace pattern shown here is Wasp Wings, from A Second Treasury of Knitting Patterns by Barbara Walker. 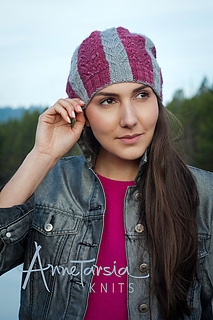 This hat is a fun and quick knit that provides lots of opportunity for creative expression— choose your own stitch patterns to make the hat truly your own.